As research continues in the field of periodontology, more and more studies seem to suggest links between gum disease and other health risks. These risks include heart disease, diabetes, complications with pregnancy and several others. As studies continue to be conducted, we find it important to keep you abreast of their findings. Should you have questions about this information, or if you would like to schedule an appointment to have one of our doctors check your periodontal health, call our Docklands dental office at (03) 9021-9487 today. Gum disease and diabetes have an interesting relationship, in that they seem to affect each other. People with diabetes have a greater susceptibility to infections, and periodontal disease often shows up in the list of side effects of uncontrolled diabetes. Diabetics who develop gum disease find themselves in double jeopardy, however, as gum disease tends to raise blood sugar levels in the body. This makes it very hard for patients with diabetes to keep their blood sugar levels under control. In effect, the two diseases enable each other. It is recommended that diabetic patients have regular checkups performed of their periodontal health, so treatment can be started at the first sign of gum disease. Recently, a group of 70 top periodontal experts from the United States and Europe came together to discuss all existing research linking gum disease to other health issues. The number one link they found was between gum disease and cardiovascular disease. Research into this link is ongoing, but as more and more evidence comes to light supporting it, experts agree that patients should be made aware of the link. Patients with other risk factors for heart disease should maintain a regular dental checkup schedule and see their general practitioner for a physical, especially if they have not had one in over a year. 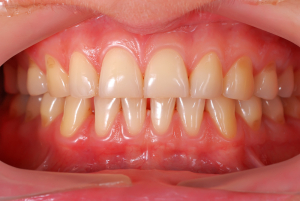 Researchers believe that the link may involve inflammation caused by advanced gum disease. While experts continue to conduct research to find an actual link, data does exist supporting the idea that pregnant women with periodontal disease may experience adverse outcomes to their pregnancy. Fortunately, periodontal therapy is perfectly safe for women carrying babies. Experts agree that women old enough to bear children should know that the possible link exists, so they can receive preventive care before conceiving. Further research has turned up links between gum disease and several other health conditions. Patients with periodontal disease are more susceptible to respiratory diseases such as pneumonia and obstructive pulmonary disease. A strong link seems to exist between gum disease and cancer, with one study finding men with gum disease around 50% more likely to develop pancreatic and kidney cancers. Studies are ongoing into possible links between periodontal disease and other systemic health problems such as kidney disease, obesity, and rheumatoid arthritis. In the meantime, you should continue to practice good dental and periodontal habits, as they may contribute to your overall health in the long run. If you would like to schedule an appointment to have your periodontal health checked, or have questions regarding the link between gum disease and your health, call our Docklands dental office today at (03) 9021-9487, and a member of our caring staff will happily assist you.